Hallwag Kümmerly+Frey is the leading publishing house in Switzerland for tourism offering a wide range of different type of maps for travelling and outdoor activities. They offer tourist maps with up-to-date, detailed information and high quality cartography to help you to plan your journey and make travelling easier. For everyone who travels around Europe and the world and frequently needs or wants to plan his/her route in advance the Hallwag international road map series is recommend. These maps provide a quick overview of the travel route, indicate distances and offer information on road classes as well as being reliable travelling companions. Every map features a detailed index of places, transit maps – for quick orientation in urban areas, legend in 4 languages as well as touring information. The Distoguide – a mileage chart incorporated into its cover, providing at a glance road distances between several towns across the country, covered by the map - is extremely practical for planning and travel. 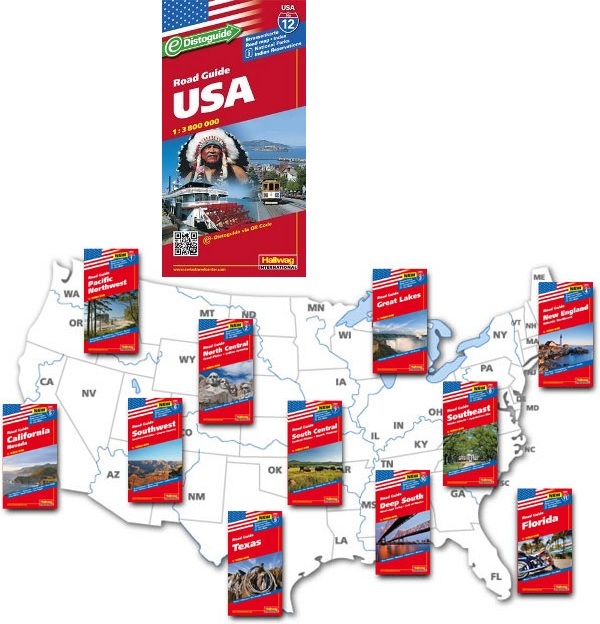 The Hallwag USA road maps at a scale of 1 / 1.000.000 provide an excellent combination of information about the terrain, the road network and places of interest. Road network clearly shows road numbers, indicates free and toll highways with locations of services, and gives driving distances on interstate and primary routes. The maps also show the railway lines with stations, local airports, state borders and time zone boundaries. 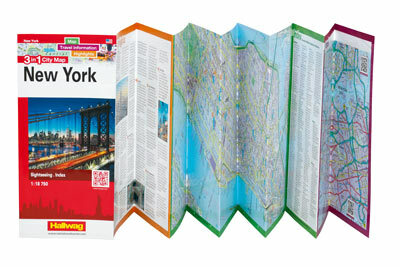 Transit and city maps, as well as detailed maps of national parks, are included in the map layout. 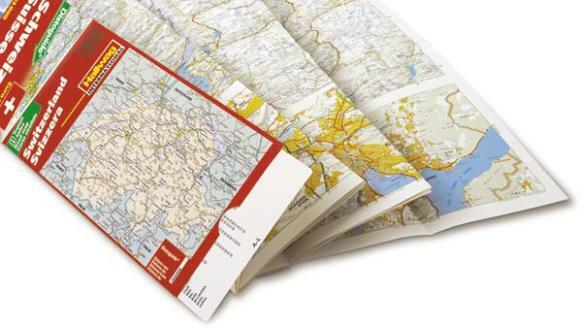 The map package also includes the publishers’ special Distoguide incorporated into its cover, providing at a glance road distances between several towns across the region, covered by the map. Including a brochure with an index of places, travel information from A to Z, top attractions and travel tips. A new series in the Hallwag product range: a road map with city plans, a travel guide and photos, so: 3 in 1, in a handy slipcase! The first title in this series is: Tuscany. 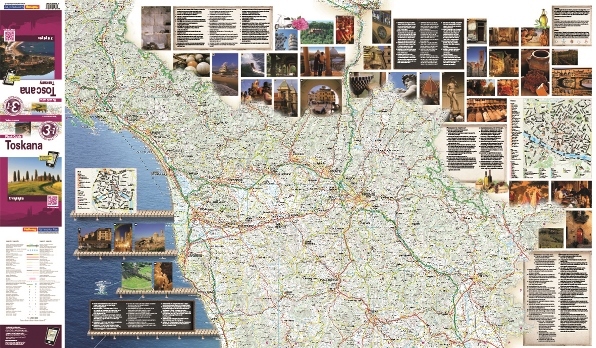 The clear overview map shows the whole region of Tuscany in a large scale 1:200.000 with all towns and places, roads and footpaths, attractions, scenic trails and national parks. The highlighted numbers on the map and guide makes searching easy and fast. City plans of the 4 most important tourist places: Florence, Pisa, Lucca and Siena with up to 65 locations, colour categories for attractions, hotels, restaurants, shopping, nightlife and sport. 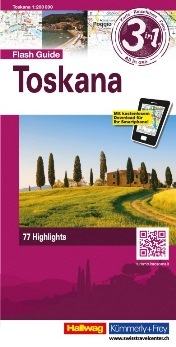 77 attractions of Tuscany briefly presented in 3 languages (German, French and English) including a photo. The same numbering of photo, text and map shows the connection of all elements and leads, additionally supported by a grid, to rapid searching. The highlights are selected from art, culture, landscape, lifestyle and culinary delights. An additional name directory facilitates the exploration of the largest and most important towns in the region. More titles in the pipeline: Riviera-Provence. The Grand Tour of Switzerland is a unique expedition, which combines the highlights of Switzerland on a journey. 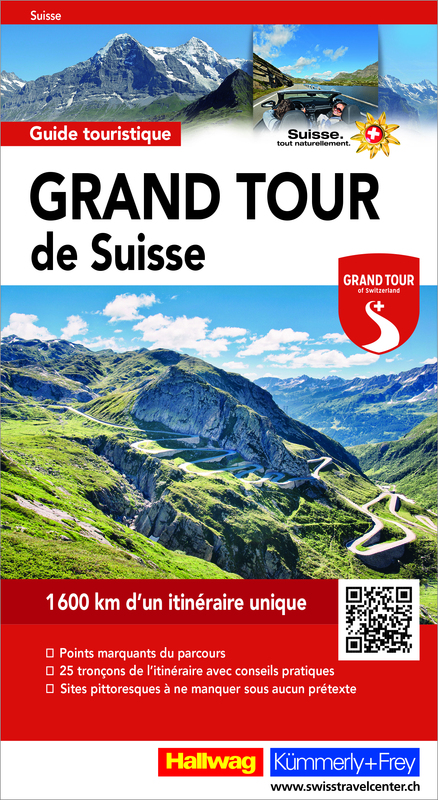 This map, which is to a scale of 1:275 000 and laminated, is as special as the "Grand Tour of Switzerland" itself. 44 highlights along the 1600-km route and the most beautiful route sections are specially marked. The map is a small tour guide in itself! Photos and descriptions in four languages (German, French, Italian and English) complement the cartographical information. It's perfect for previewing and reminiscing about the many attractions along the memorable "Grand Tour of Switzerland". Free download for smart devices included! To really know Switzerland, you need to see it repeatedly from different perspectives. And the "Grand Tour of Switzerland" – a wondrous route that winds through the entirety of Switzerland – offers this very opportunity. It's a route of more than 1600 km along stunning backdrops of natural beauty. Passing alongside lakes and secluded spots, the route offers up stunning vistas from Alpine passes and even takes in the cultural and scenic highlights of eleven of which UNESCO World Heritage Sites and two biospheres. 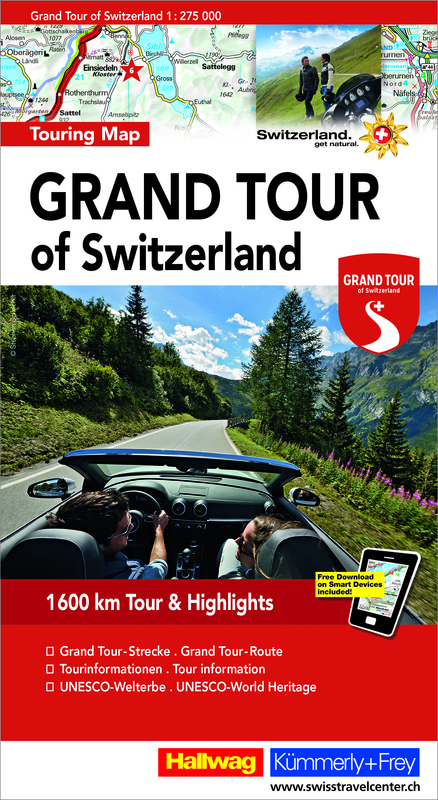 The "Grand Tour of Switzerland" Tour Guide, comprising 288 pages describes route highlights, offers recommendations for each of the 25 route sections and points out the top attractions. 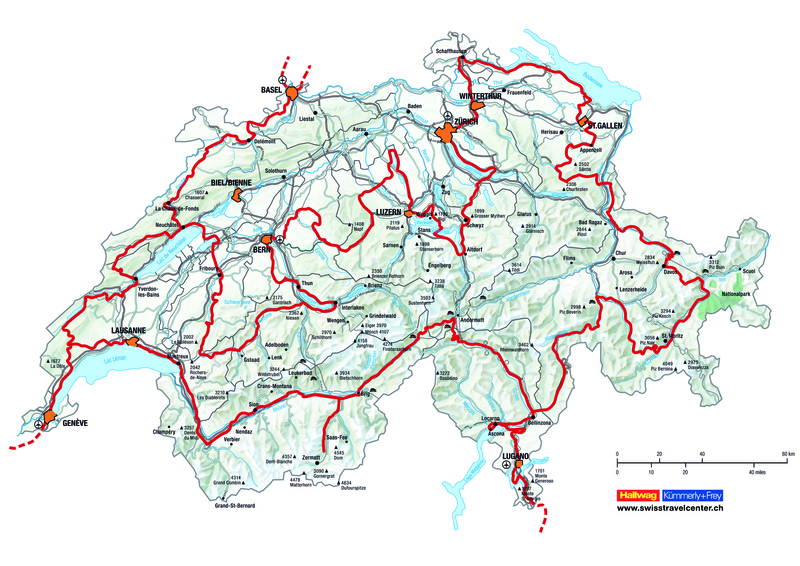 The Tour Guide comes with a map of Switzerland to a scale of 1:500 000 marked with the Grand Tour route. up-to-date amendments via QR-Code (airports, local traffic, fairgrounds...). Clear, at-a-glance graphic layout, practical to use and easy to fold.